It’s not enough to have a plan; you have to follow through. Recently, I was hiking with my family in the mountains a couple of hours west of Denver. During the hike, we were crossing a stream, and in my attempt to help my daughter across, I slipped and came down hard on a pile of rocks. Upon inspection, it was only a surface-level injury, something that I could easily patch up with my first-aid kit—which was in my car about five miles away. I was prepared in that I had thought to purchase a first-aid kit, but I had failed to actually put the kit in my backpack. Preparation without full implementation isn’t particularly useful. Of course, leaving my first-aid kit behind wasn’t simply an oversight. It was likely a semi-conscious decision resulting from overconfidence, coupled perhaps with a lack of imagination. I’ve gone on more than 100 hikes in the mountains and I “never” get hurt, so ensuring my first-aid kit was in my pack wasn’t front of mind. And therein lies the point. When nothing bad has happened in recent memory, we get lulled into a false sense of security. Risk management is boring until it’s not; just ask any security guard or TSA official. And risk management isn’t simply about judging the probability of a loss, but also the magnitude of a loss should one occur. Nine years have now passed since the stock market bottomed out during the financial crisis. U.S. equities have annualized at between 16.9% for the largest companies (based on the Russell Top 200 Index) and 18.7% for mid-sized companies (based on the Russell Mid-Cap Index as of 12/31/2017), with micro-cap and small-cap stocks falling in between. These outsized gains, along with our temporal distance from the pain felt during the crisis, have made it increasingly difficult to stay invested in risk-mitigating strategies. This year has ushered in a new period where volatility will be more in line with historic levels (i.e., much higher than previous years), requiring investors to remain diligent about risk management. 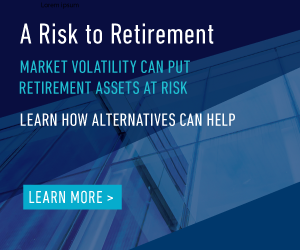 While equity valuations and interest rates continue to rise, investors need to consider what changes are necessary to position themselves for potential increases in volatility in the coming years. As we’ve pointed out many times, the math of a big loss is daunting. Millions of people were headed to retirement with heavy equity concentrations in 2008 when the Dow Jones Industrial Average began its precipitous fall, averaging a 54 percent decline when all was said and done. To put this into context, a loss of 10 percent requires an 11 percent gain to recover. However, as the loss grows, so does the size of the return needed to recover. 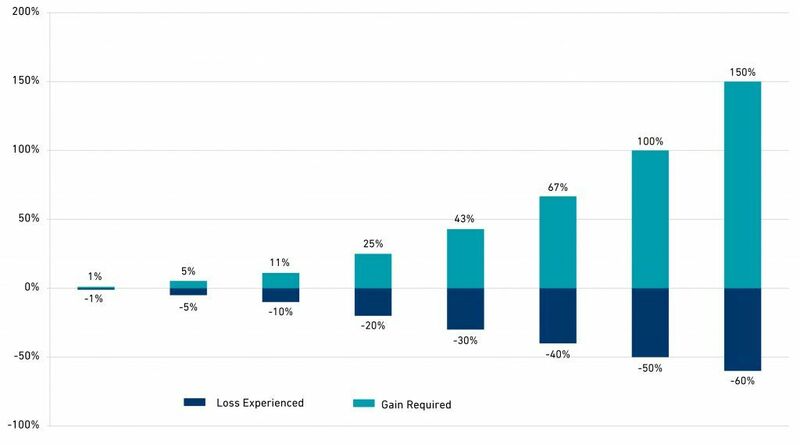 Indeed, a 50 percent loss requires a 100 percent gain to recover and a 60 percent loss requires a 150 percent gain just to get back to even. With market indices once again hitting all-time highs and pre-retirees all too eager to ride the equity wave, the issue of complacency—and danger—is apparent. Too many investors fail to realize that it’s not only about the loss of monetary resources, but also the loss of time in which to make them back. For young investors just starting out, its impact is negligible. Not so for their older counterparts, one reason sequence-of-return risk rises with time, and at its highest just before retirement. Investors should be assessing the risks in their portfolios now, before the next downturn begins, and explore strategies that have the flexibility to go both long and short. If the concern is equity market volatility, then long/short equity or equity market-neutral strategies should be considered. If rising default rates in the bond market are worrisome, consider long-short credit strategies. If you are searching for a source of returns that has a low correlation to traditional assets, consider managed futures funds. But whatever you do, remember this, protection from adverse market events needs to be in place prior to the occurrence of those events in order to be effective. If the due diligence report on that long/short equity fund you’ve been “watching” is gathering dust on your desk when the market takes a 20% hit, it won’t matter that you started to prepare, only that you failed to implement. This year has ushered in a new period where volatility will be more in line with historic levels, requiring investors to remain diligent about risk management. Risk management should be of primary concern given equity valuations and interest rates. Investors should be assessing the risks in their portfolios now, and explore strategies that have the flexibility to go both long and short.